Baskin-Robbins readies for Valentine's Day with the introduction of the new, limited-time $5 Love & Kisses Sundae. They also add Cherry Cordial with Kisses ice cream as the February 2019 Flavor of the Month. The festive sundae starts with a scoop each of Cherry Cordial with Kisses, Love Potion 31, and Very Berry Strawberry ice creams. it's then topped off with marshmallow, hot fudge, and strawberry toppings plus whipped cream, chopped almonds, and Hershey's Kisses. 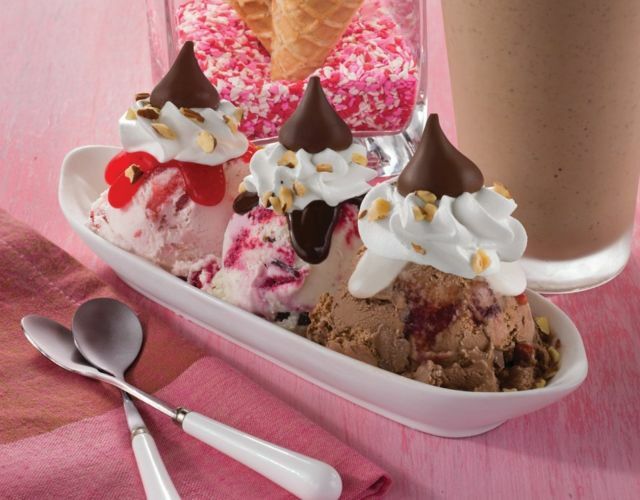 Cherry Cordial with Kisses ice cream features Hershey's chocolate ice cream, mini Hershey's Kisses, and a cherry ribbon. Baskin-Robbins will be sampling the new flavor on Sunday February 10, 2019, from 3 to 7 PM at participating locations nationwide. Also in celebration of Valentine's Day, they have waffle cones dipped in chocolate and heart-shaped sprinkles available with any ice cream for a limited time. - Hershey's Kisses Cake - A pink cake topped with Hershey's Kisses and red, pink, and white heart-shaped sprinkles. - Love Banner Cake - A white heart-shaped cake topped with your Valentine's name and a message of your choice. - Pink Conversation Heart (Kiss Me) Cake - A pink, heart-shaped cake made to resemble a conversation heart candy, decorated with the words, "Kiss Me," as well as with red, pink and white heart-shaped sprinkles ringing the bottom.